As the UN Human Rights Council celebrates its 10th anniversary with endless self-congratulatory speeches, UN Watch will be reporting daily on the debates of the June 2016 session. Click here for UN Watch’s assessment of the council’s performance over the past decade. Today, states at the UN Human Rights Council put aside misgivings over “politicized reports” and “confrontational approaches” and came together over a shared hatred of Israel. 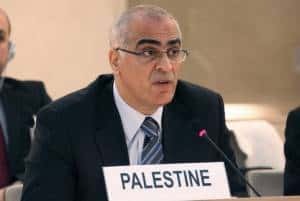 The council met under its only standing agenda item devoted to a single nation—”The Human Rights Situation in Palestine and the Other Occupied Arab Territories”—as countries took the floor to excoriate the Jewish state. EU nations’ decision to boycott the biased debate earned them stern criticism from Arab and Islamic states. Ecuador thanked Palestine for sending doctors following the recent earthquake in the country, scrupulously avoiding any mention of the Israeli health team sent at the same time. Egypt denounced Israel’s “shameful” refusal to participate in the discussion.